When you first create a SharePoint 2013 team site, it has links in the shape of moving tiles on the start page. These links are called promoted links, and you can create them yourself and place them on any SharePoint page you wish. In the demo below Peter Kalmstrom, CEO of kalmstrom.com Business Solutions and Microsoft certified SharePoint specialist and trainer, explains how to create your own promoted links. After removing the default promoted links Peter creates a new Promoted Links app for his own links, places that app on a page and adds images to it. Open the Site Contents and click on "add an app". Give the app a name. Remove the app from the Quick Launch. Open the new app and go to the All Promoted Links view. In edit mode, insert the anchor text and URLs for your links. 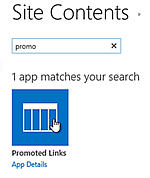 Click on Tiles and check that the promoted links look ok.
Open the SharePoint page where you want to place the app in edit mode. Open the page where you want to place the image link in Edit mode. Click on the App Part button under the Insert tab. Select the newly created Promoted Links app. Make any changes you want to do to the app part before you save it. Any image can be used. The size will be 150x150px, so if you use a bigger image it will be compressed. Avoid using a smaller image, as it will give bad quality. 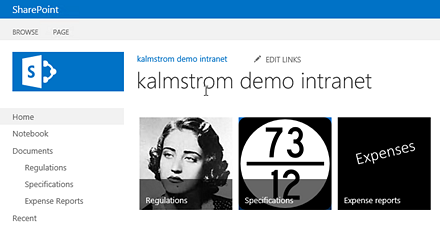 Save the images to the Site Assets library of your SharePoint site. Open the Promoted Links app in edit mode and add the image links.